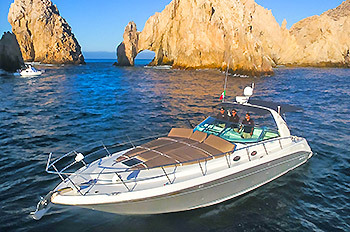 Please send me more information on Cabo Sailing! Sailing on beautiful Baja waters is always a treat, but that pleasure jumps higher on the scale when you’re on board a nimble, beautiful boat, stocked with goodies and good cheer. The Chica is just a vessel, a 30-foot Newport with modern outfittings and spacious comfort. 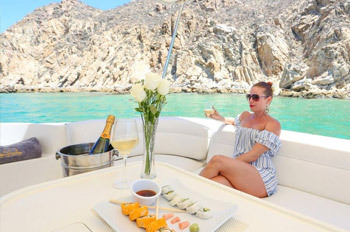 The Chica can transport you to some captivating snorkeling sites or you can relax on a sunset cruise to some of Los Cabos’ most picturesque places, such as the dramatic rock formations of Land’s End. Either venue guarantees good food, good company and good times. 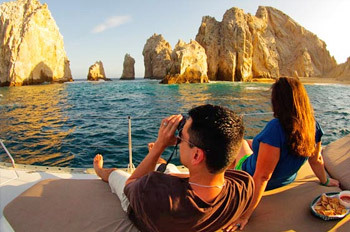 Sail the Chica and exult in the warm, legendary breezes of Cabo. Featuring spacious cushions at the front deck and also seats by the covered aft cockpit, large cabin below equipped with a full kitchen and bathroom. 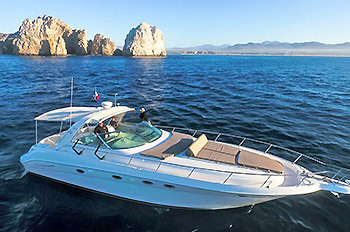 Enjoy a light and smooth sailing experience on board this boat that is perfect for parties up to 12 guests. SYNERGY & MISTRAL are luxurious Hunter 42 passages. Featuring two fully furnished cabins each with shower and head, a luxurious main salon and a chef’s galley, these modern, high performance sailing vessels have all the amenities you might need for a comfortable and memorable cruise. Above deck her comfort continues. A large cockpit, full padded sun lounges, and a stepped transom leading to a comfortable swimming platform and ladder make these sailboats the perfect setting for fun in the Baja sun. 400 Sea Ray built with the highest luxurious standards. An open cockpit with lounge, comfortable seats and padded cabin-top make for a smooth safe ride. Its sleek modern lines and top notch cabin ensure you got everything you need on board including toilets, shower and changing room. Twin powerful engines along with a dynamic V – hull provides a smooth ride in any conditions. Built-in sound system, snorkeling gear, towels and wet-suits are among the amenities we thought will make you cruise a perfect one. 460 Sea Ray Sun Dancer Sport Cruisers with an open cockpit, large lounge comfortable leather seats and padded cabin-top that make for a perfect smooth ride. Featuring sleek modern lines and a top notch cabin with air conditioning, high fidelity sound system, two bathrooms, a changing room and full kitchen. Powerful engines along with a dynamic V- hull that provides a smooth ride in any condition. The yacht is equipped with snorkeling gear, towels, wet suits and floating devices for your use while on aboard this great ocean experience. All shared tours include open bar, beverages and a light meal/snacks. Round trip transportation is not included but can be added at $25/person. Morning cruises include snorkeling gear, flotation equipment, towels and wet suits. All private tours include open bar, and choice of menu (please contact for menu). Departure times are flexible for private tours and can be changed upon request. Suggested departure times are 10am, 1pm, 5pm. * We are as committed to your safety as we are to your pleasure. We follow Coast Guard regulations and keep well-maintained safety equipment onboard at all times. * Crew t shirts and underwater disposable cameras are available on board our boats upon request. All prices are in US dollars and include tax. Gratuity for the crew is not included.